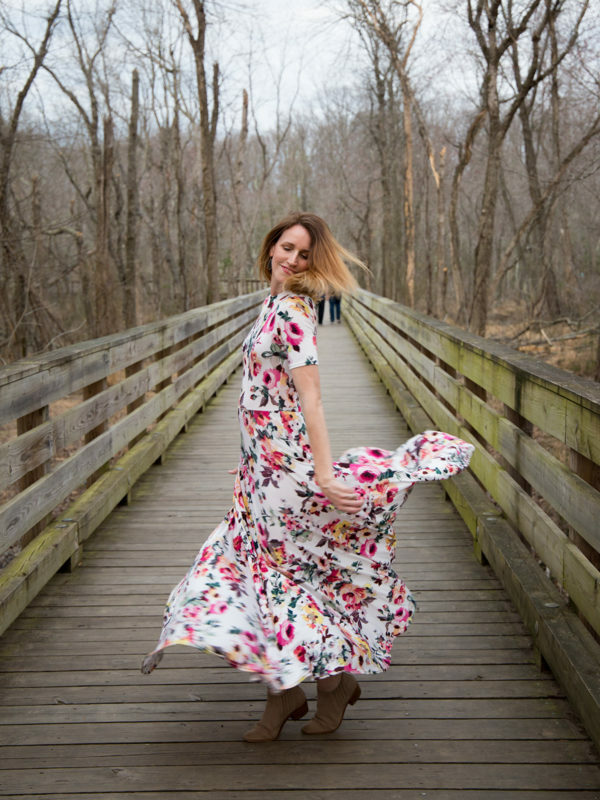 I’ve been really wanting a maxi knit dress that has a fitted bodice lately and as soon as I saw Megan’s newest pattern, the Rowan, I knew I just had to turn it into a dress. I’m absolutely in love with this dress and I’m so excited to share with you how to put it all together. Adding a circle skirt to the Rowan is super easy. The hardest part is making the pattern piece. As an ex-high school math teacher, I have you covered though. So, without any more delay, let’s get started! Fabric: You will need a lot! I used 5 yards for my maxi dress and have very little left. 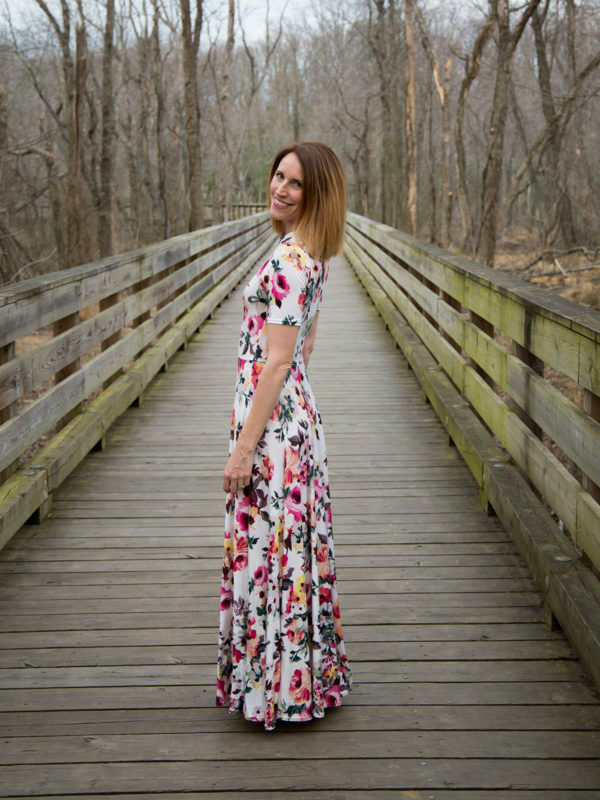 I recommend using a 4-way stretch knit that is not directional and if you are making a maxi dress, make sure to get something that’s 60″ or wider. My fabric is a rayon poly blend I purchased at Knitpop. 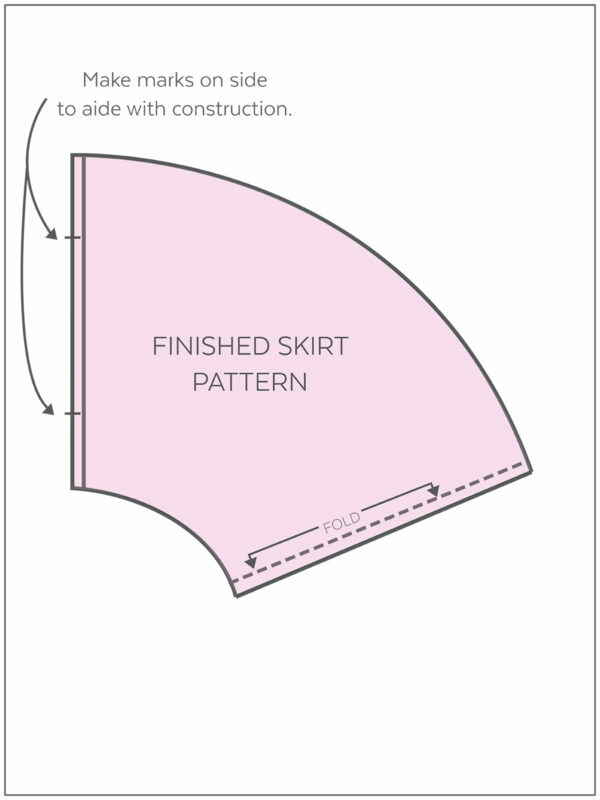 Paper for making skirt pattern: If you are making a maxi, the skirt pattern piece will be quite large. Keep that in mind. Clear Elastic: This dress will be quite heavy when finished. You will need this for the shoulder seams and waist seam. On the actual pattern piece the smallest point (the waist measurement) will be 1/4″ above the dashed line for lengthening or shortening. This will be important later. Now that we have our finished waist measurement, we have a measurement we can use to create our skirt pattern piece. I chose to create a 270° circle skirt for my dress, so this tutorial will show you how to do the same. The waist measurement will be used as the circumference of the inner circle of the pattern piece. Before we can draw the inner circle, we need to figure out the radius of that circle. Now, I might lose you here, but I’m a firm believer in understanding the why to problems instead of just being fed the solution. If I lose you, don’t worry. I have created a fabulous chart to help you be successful. The formula we use for the Circumference of a circle is C=2?r. 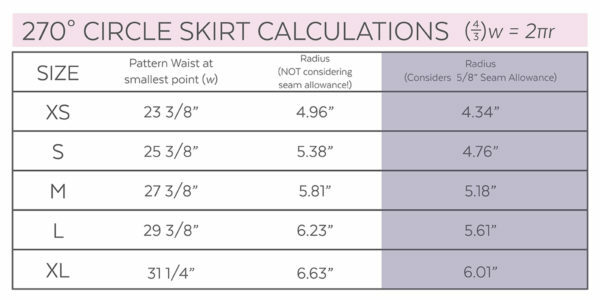 It might be tempting to plug in the Rowan waist measurement from the chart above for C, but we are doing a 270° circle skirt, not a full 360° skirt. We need to take our waist measurement (w) and multiply it by 4/3. Think of the 270° as 3 pieces of pie and we want to know the measurement for 4 pieces of pie. 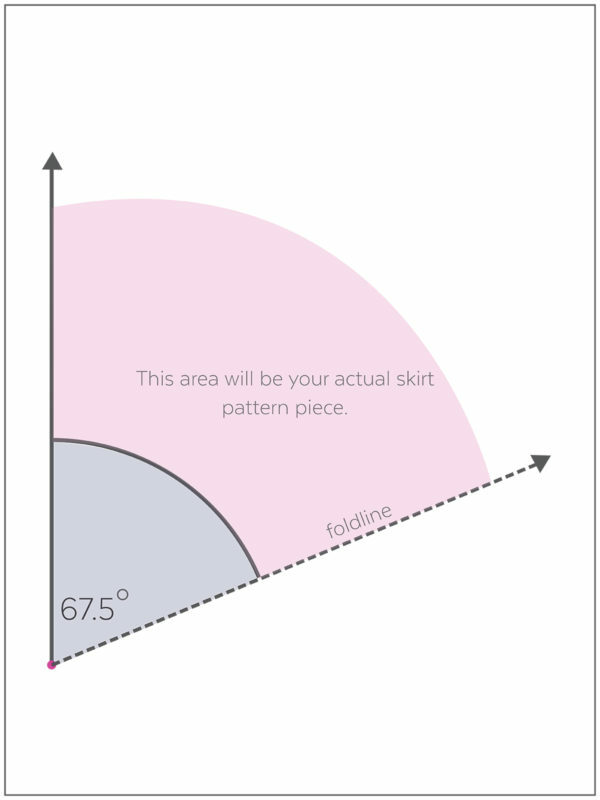 If you were doing a 180° circle skirt you would multiply w by 4/2 or simply 2. Plug that number in for C and solve for r. r in this case will be the radius before we add in a seam allowance, essentially the radius for the circumference of the actual seam. 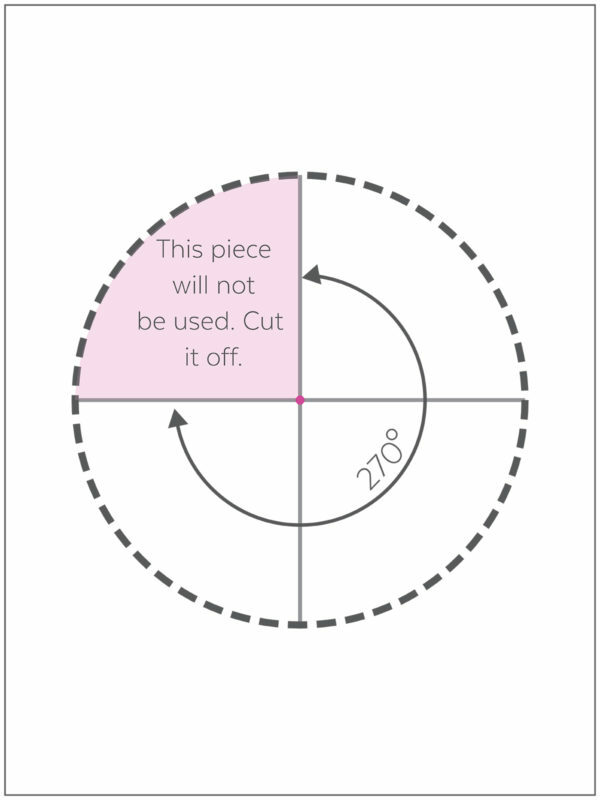 Because our pattern piece will be moving away from this circle, we will need to subtract 5/8″ from our radius to create a circle that can be used for our pattern piece. Okay, okay. I’ve probably totally lost you. Here is the chart I promised you. You will be using the number in the shaded column according to your size. Now, it’s time to get drawing. 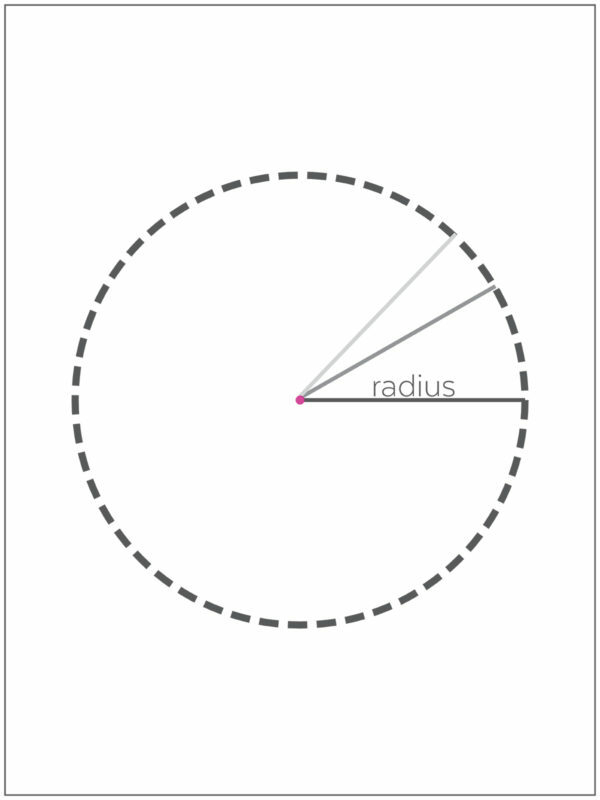 Step 1: Using at least a 13″ square piece of paper, draw a circle using the radius from the chart above. The number in the shaded column. You can simply measure from a center point and make dots in a circle and then connect or use a piece of non stretchy string and a pen to create your circle. Make sure your center point is clear. You will need it for the next step. Step 2: Since we are making a 270 degree skirt, we will only be using 3/4 of this full circle. Draw 2 lines perpendicular to one another through the center point to create 4 even pies. Cut out 1 of the 4 pies and cut out your 270 degree circle. Step 3: The 270 degree circle is for all the way around the skirt. 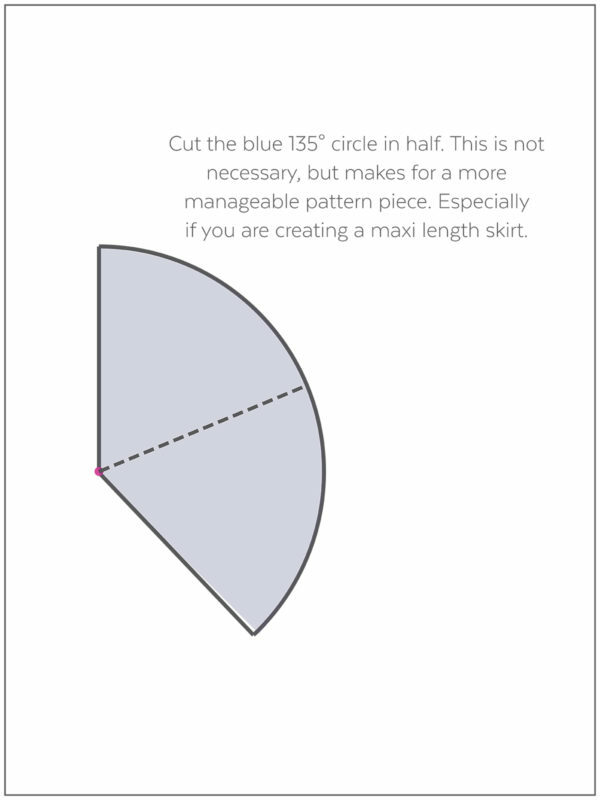 If you are doing a mini, you may be able to use this full piece and create a single pattern piece to use. I will be cutting down this full 270° circle to make a more manageable pattern piece. 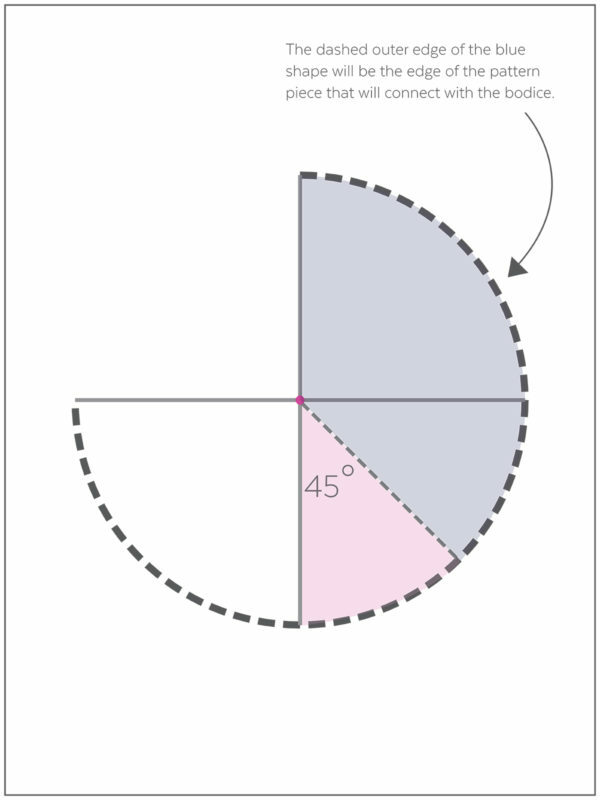 First, draw a line through the center point and through the middle pie at a 45° angle. You can also just fold the circle piece in half to find that center line. Cut through the line. You will now have a 135° circle (blue area), essentially the piece used to create the front or back piece. Step 4: Fold the 135° piece in half one more time, creating a 67.5° circle. If you don’t mind having a really huge pattern piece, you can use the 135° piece, but I chose to have a smaller more manageable pattern piece. Step 5: Now we will begin drawing the lines for the actual skirt pattern piece. You will need a really large sheet of paper. I used swedish medical paper and had to tape a couple pieces together to make it wide enough. Place your small 67.5° circle on the short edge of your paper and tape it down. Extend the straight lines beyond the desired length of the skirt. Step 6: Decide on the desired length of your skirt piece. Measure from your natural waist to the desired length. You may need someone else to help you here. Then, add 5/8″ for the seam allowance to be attached to the bodice, plus 1/2″ for the bottom hem. 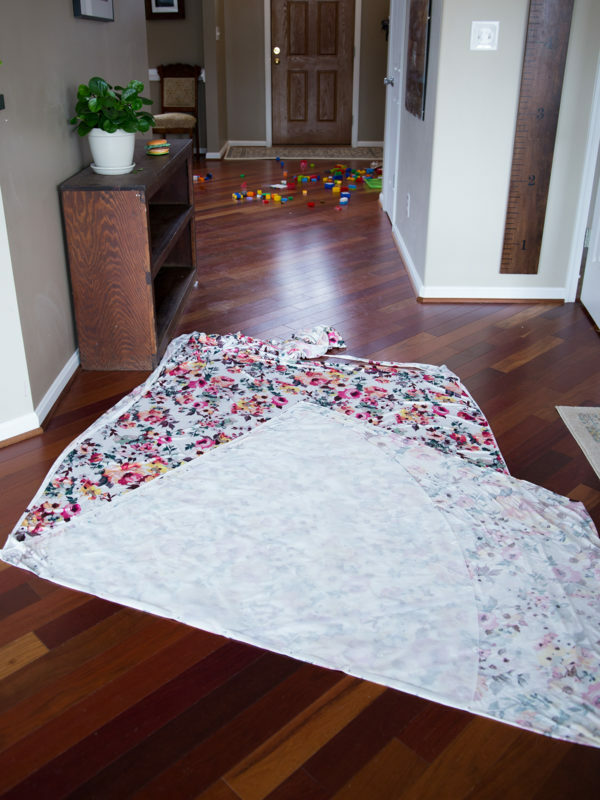 For my maxi, I made my skirt piece 42″ long. I’m 5’8″. The best way to do this is to measure from the inner circle out on one of the straight lines, then make a mark. I used a piece of thread, a pin and a pen to create the outer circle from here. Simply poke a pin through your center point on the small circle. Tape it down so the pin head is all that you can see. Wrap and tie a piece of thread around the pin head and extend to the mark you had made. Tie the thread around a pen close to the base so the pen will mark at the desired length. Then simply rotate around till you reach the other straight line. Measure to check that the distance remained the same throughout. Step 7: This pattern piece still does not include the seam allowances for the side seams. Go ahead and draw 2 parallel lines 5/8″ away from the straight lines. I did both sides, so if I ever want to use a fabric that is directional I can use this pattern piece and have a center seam down the front and back. If you are not going to have a center seam, simply fold up and tape one of the seam allowances and use that side for on the fold. Step 8: Cut out your finished pattern piece and add some marks along the side seam. This will help you with the construction later. The hard part is done! Now we can prepare our fabric. Work on the floor. You need a lot of space and you don’t want your fabric falling off a table pulling the knit. Work on a hard floor preferably, such a wood floors or tile. It’s really easy to get ripples in your fabric or have things pull in certain areas if you are working on carpet. Use lots of pins and cut slowly! Cut out your skirt pieces first, then use the leftovers for the bodice. Here is a photo of me laying out my pattern piece on my fabric. Please excuse the lego mess! Notice the placement of my fold. It’s at an angle. It needs to be that way in order to get everything to fit. This is why I recommended you not use directional fabric. For the bodice pieces, you will not be cutting the full length of the tee. 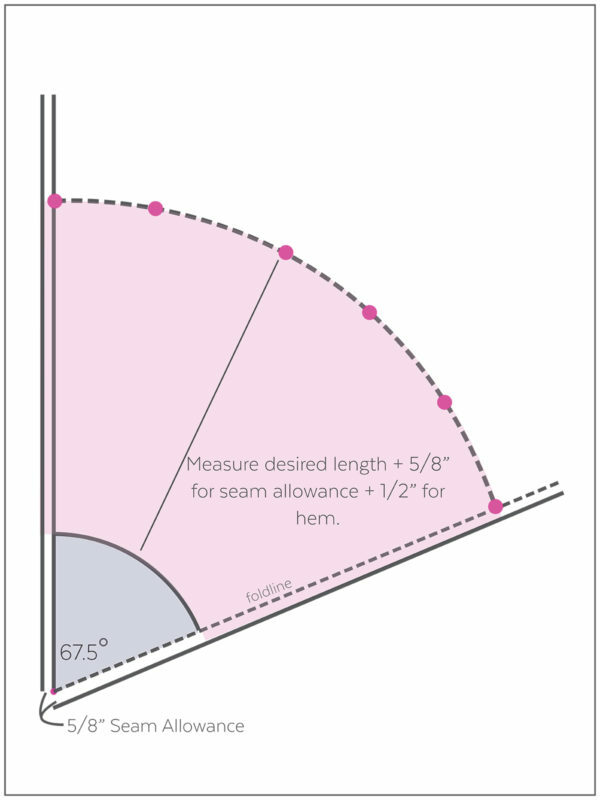 Cut your pattern pieces 3/8″ below the shorten/lengthen dashed line. This gives you a 5/8″ seam allowance below the smallest point on the pattern. Sewing the dress together is so simple. I really don’t think there is a need for a step by step tutorial. You will simply follow the directions for the Rowan tee, leaving the tee unhemmed. Make sure to use clear elastic on the shoulder seams. You can also add clear elastic to the side seams, but I don’t think it’s necessary unless you feel your fabric is very delicate. With the 2 skirt pieces right sides together, sew along the two side seams. Then while the skirt is inside out and upside down, place the bodice right side out inside the skirt matching up the raw edges of the bodice to the raw edges of the skirt. Make sure the side seams line up. Pin in place and sew. 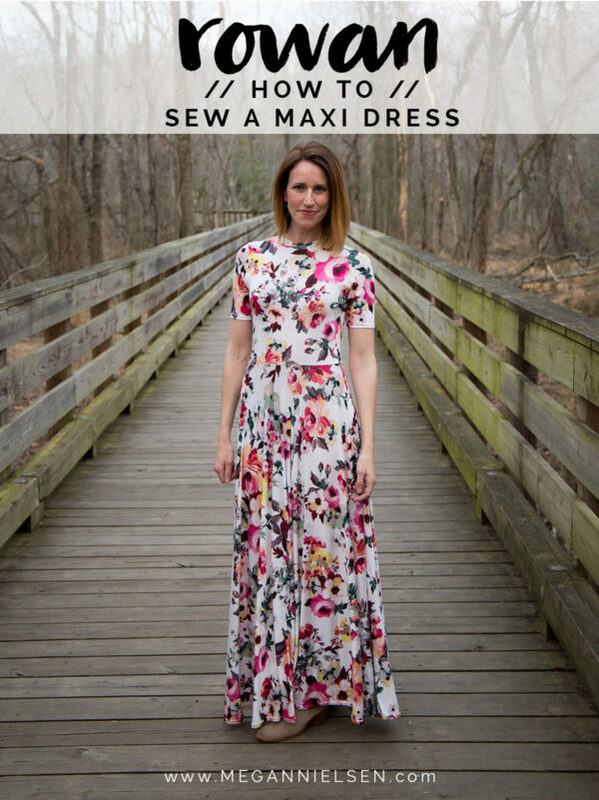 It is really important to add clear elastic to the waist seam, especially if you are creating a maxi. This will strengthen the seam. Try the dress on at this point to see if you need to trim off any of the length. Due to the weight of the dress, I had to trim 2″ off the bottom of my dress before hemming. Thank you to my husband for helping mark everything for me while I was wearing the dress! Then, fold 1/2″ up and hem using a twin needle, zig-zag stitch or converstitch. That’s it! I hope I didn’t confuse you with all the calculations in the beginning! If you have any questions, please let me know. 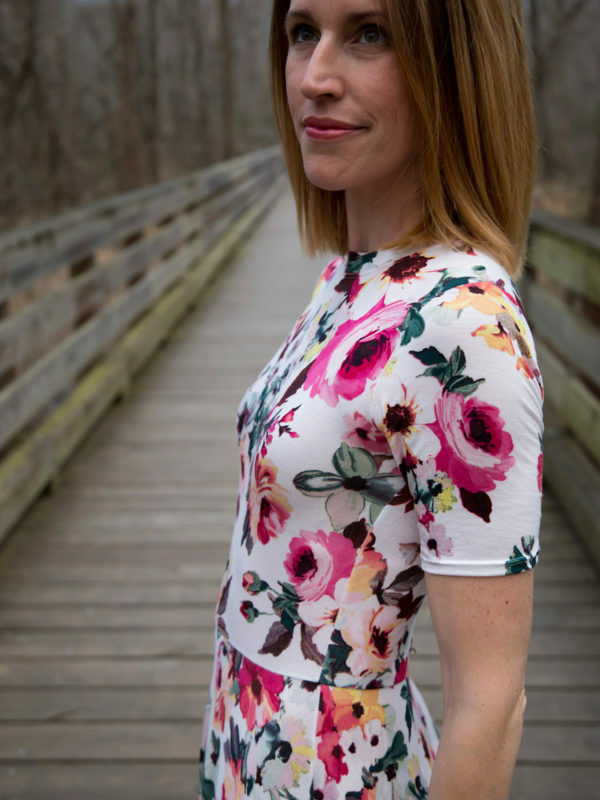 I’m really loving the comfort of this dress and I find it to be so flattering, so I hope you will take the time to make one yourself! 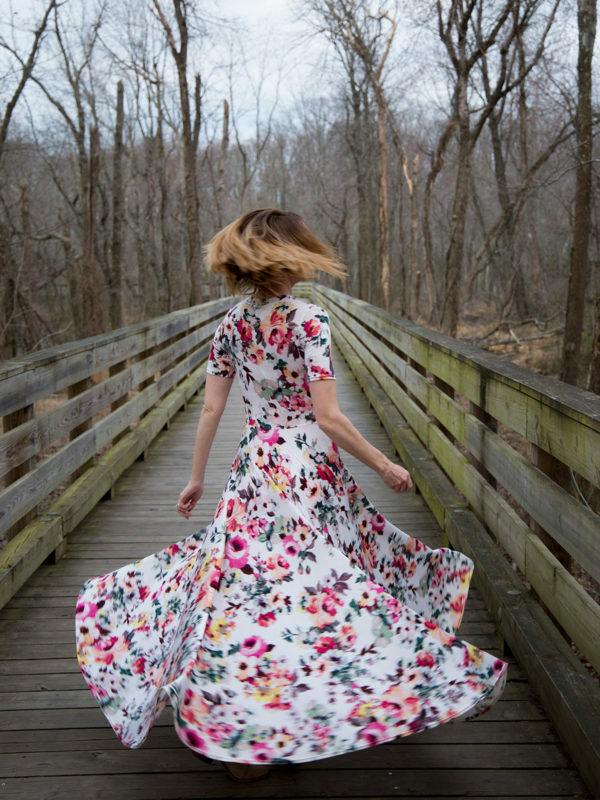 And, one more because spinning in this dress is so much fun! Don’t have the Rowan sewing pattern yet?! Order Rowan today! We absolutely love seeing what you make, so don’t forget to tag your creations with #MNrowan and @megannielsenpatterns when sharing on social media, and check out what everyone else is up to! Oh my goodness, that looks incredible. I think I’m going to have to try that for myself.